The 74F154 decoder accepts four active High binary address inputs and provides 16 mutually exclusive active Low outputs. The 2-input Enable (E0, E1) Gate CAN be used to strobe the decoder to eliminate the normal decoding ,glitches, on the outputs, or it CAN be used for expansion of the decoder. The enable Gate has two AND,ed inputs which must be Low to enable the outputs.The 74F154 CAN be used as 1-of-16 demultiplexer by using one of the Enable inputs as the multiplexed data input. When the other Enable is Low, the addressed output will follow the state of the applied data. 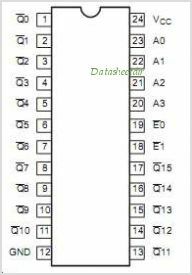 This is one package pinout of 74F154,If you need more pinouts please download 74F154's pdf datasheet. 74F154 circuits will be updated soon..., now you can download the pdf datasheet to check the circuits!